For other uses, see Cinderella Man (disambiguation). Cinderella Man is a 2005 American drama film by Ron Howard, titled after the nickname of heavyweight boxing champion James J. Braddock and inspired by his life story. The film was produced by Howard, Penny Marshall, and Brian Grazer. Damon Runyon is credited for giving Braddock this nickname. Russell Crowe, Renée Zellweger and Paul Giamatti star. James J. Braddock is an Irish-American boxer from New Jersey, formerly a light heavyweight contender, who is forced to give up boxing after breaking his hand in the ring. This is both a relief and a burden to his wife, Mae. She cannot bring herself to watch the violence of his chosen profession, yet she knows they will have no good income without his boxing. As the United States enters the Great Depression, Braddock does manual labor as a longshoreman to support his family, even with his injured hand. Unfortunately, he cannot get work every day. Thanks to a last-minute cancellation by another boxer, Braddock's longtime manager and friend, Joe Gould, offers him a chance to fill in for just one night and earn cash. The fight is against the number-two contender in the world, Corn Griffin. Braddock stuns the boxing experts and fans with a third-round knockout of his formidable opponent. He believes that while his right hand was broken, he became more proficient with his left hand, improving his in-ring ability. Despite Mae's objections, Braddock takes up Gould's offer to return to the ring. Mae resents this attempt by Gould to profit from her husband's dangerous livelihood, until she discovers that Gould and his wife also have been devastated by hard times. With a shot at the heavyweight championship held by Max Baer a possibility, Braddock continues to win. Out of a sense of pride, he uses a portion of his prize money to pay back money to the government given to him while unemployed. When his rags to riches story gets out, the sportswriter Damon Runyon dubs him "The Cinderella Man", and before long Braddock comes to represent the hopes and aspirations of the American public struggling with the Depression. A title fight against Baer comes his way. Braddock is a 10-to-1 underdog. Mae is terrified because Baer, the champ, is a vicious man who reportedly has killed at least two men in the ring. He is so destructive that the fight's promoter, James Johnston, forces both Braddock and Gould to watch a film of Baer in action, just so he can maintain later that he warned them what Braddock was up against. Braddock demonstrates no fear. The arrogant Baer attempts to intimidate him, even taunting Mae in public that her man might not survive. When he says this, she becomes so angry that she throws a drink at him. She is unable to attend the fight at the Madison Square Garden Bowl or even to listen to it on the radio. On June 13, 1935, in one of the greatest upsets in boxing history, Braddock defeats the seemingly invincible Baer to become the heavyweight champion of the world. An epilogue reveals that Braddock later worked on the building of the Verrazano Bridge, owning and operating heavy machinery on the docks where he worked during the Depression, and that he and Mae used his boxing income to buy a house, where they spent the rest of their lives. During filming in Toronto, several areas were redressed to resemble 1930s New York. The Richmond Street side of The Bay's Queen Street store was redressed as Madison Square Garden, complete with fake store fronts and period stop lights. A stretch of Queen Street East between Broadview and Carlaw was also made up to appear to be from the 1930s and dozens of period cars were parked along the road. Maple Leaf Gardens was used for all the fight scenes, and many scenes were filmed in the Distillery District. Filming also took place in Hamilton, Ontario at the harbour for the dock workers' scene. The main apartment was shot north of St. Clair Avenue on Lauder Avenue on the east side. An awning was put up for a dress shop, later turned into a real coffee shop. The Toronto Transit Commission's historic Peter Witt streetcar and two more cars from the nearby Halton County Radial Railway were used for the filming, travelling on Toronto's existing streetcar tracks. In a campaign to boost ticket sales after the film's low opening, AMC Theatres advertised on June 24, 2005 that in 30 markets (about 150 theaters nationwide), it would offer a refund to any ticket-buyer dissatisfied with the film. The advertisement, published in The New York Times and other papers and on internet film sites, read, "AMC believes Cinderella Man is one of the finest motion pictures of the year! We believe so strongly that you'll enjoy Cinderella Man we're offering a Money Back Guarantee." The promotion moderately increased box office revenue for a short period, while at least 50 patrons demanded refunds. Following suit, Cinemark Theatres also offered a money-back guarantee in 25 markets that did not compete with AMC Theaters. AMC had last employed such a strategy (in limited markets) for the 1988 release of Mystic Pizza, while 20th Century Fox had unsuccessfully tried a similar ploy for its 1994 remake of Miracle on 34th Street. Rotten Tomatoes gave it an approval rating of 80% based on reviews from 207 critics. Metacritic gives the film a score of 69% based on reviews from 40 critics. It received an A+ rating from CinemaScore. During its North American theatrical run, the film (which cost $88 million) earned $61,649,911. Max Baer is portrayed as a brutal person who behaves inappropriately outside the ring and viciously inside it (to the point of killing two opponents). In the film, Baer is shown making a pass at Braddock's wife in a nightclub, and warning Braddock that he might kill him in the ring. There is no evidence that this incident happened. Baer's relatives, among whom his son Max Baer Jr., and boxing historians have criticized this depiction of him, arguing that Baer killed one man in the ring, Frankie Campbell, not two. The film contends he also caused the slightly delayed death of Ernie Schaaf, and was considered by many to be a gentleman. This is supported by historical evidence which shows that Baer's demeanor, both within and outside the ring, was much less brutal than the film portrayed. On the other hand, the portrayal of Baer's style of boxing in the film is very close to what happened in the actual bout with Braddock. The author of the book on which the film was based has asserted that Baer was kind, intelligent, charismatic, good humored and clowning, loved and respected. He fought to win, brutally when he had to. Prize fighting by its nature is brutal and violent. He pointed out the emotional pain that Baer endured the rest of his life following Campbell's death, and the fact that Baer gave purses from his bouts to Campbell's family to help provide Campbell's children with an education. The film's depiction of Baer is similar to that in the press in the 1930s, and often used by promoters to attract interest in his fights. The real Baer (who was also an actor) did star as a negatively depicted, hostile boxer in the film The Harder They Fall. Baer was actually a Jewish activist who wore a large Star of David on his boxing shorts in fights. That star makes it easy to distinguish Baer from Braddock in the black-and-white film footage of their bout. 1 2 3 "Cinderella Man (2005)". Box Office Mojo. Retrieved June 5, 2010. ↑ "Internet Movie Database – List of Films shot in Hamilton, Ontario". Retrieved January 29, 2008. ↑ Stack, Tim (July 1, 2005). "Cinde-Refund: AMC is offering refunds to unsatisfied moviegoers – The exhibitor is giving customers their money back if they didn't like Cinderella Man". Entertainment Weekly. Retrieved December 12, 2006. ↑ Johannes, Amy (July 5, 2006). "AMC Offers Refund for Cinderella Man". PROMO Xtra. Retrieved December 12, 2006. 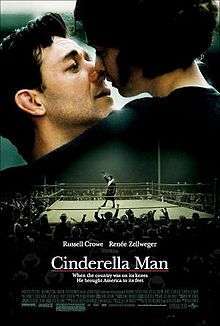 ↑ "Cinderella Man (2005)". Rotten Tomatoes. Retrieved July 5, 2010. ↑ "Cinderella Man Reviews". Metacritic. Retrieved 2014-01-28. ↑ "Why CinemaScore Matters for Box Office". The Hollywood Reporter. 2011-08-19. Retrieved 2014-01-28. ↑ Film of real contest between Baer and Braddock Archived May 2, 2008, at the Wayback Machine. ↑ Turley, Jonathan (September 17, 2006). "Give the Dead Their Due". Washington Post. Retrieved April 7, 2007.